So you want to improve your travel photography? Nice! In this guide, you'll learn how to use your DSLR for your next trip. I'll cover all the DSLR basics – with real-life examples – and tons of practical tips for beginners, so you can begin using this right away. The post is divided into 13 lessons. 1. Should I Shoot in RAW or JPEG? Does it Matter? 2. What are Pixels? Are They Important in a DSLR? 5. What Does Shutter Speed Do? What Does Adjusting Shutter Speed Do? Shutter Priority Makes Creativity Easier! 7. What is Aperture in a Camera, What Does it Do? What is Aperture in a Camera? What Does Adjusting The Aperture Do? Here's a taste of what is covered in this guide. Don't let this overwhelm you. Just bookmark the page, and work through this one lessong at a time. Be sure to have your camera in hand! Should I Shoot in RAW or JPEG? Does it Matter? What are Pixels? Are They Important in a DSLR? What is Aperture in a Camera, What Does it Do? Note: As you'll probably notice, many of the photos have a ClickLikeThis watermark. This post was originally published there, but we since changed that site to be just about GoPro photography. Whether you are planning to move to Barcelona, visit Denmark, or go on a gorilla trek in Uganda, travel photography is important. Not only does it capture your memories, but good photos are great for sharing and even for blogging about when you return home. Here's how to start your own travel blog. Lonely Planet's Guide to Travel Photography will help you understand the basics of composition and storytelling. What is the best DSLR camera? You might enjoy these posts that we wrote: How to choose the best travel camera and the best camera for safari. In each post, we make recommendations for the best DSLR camera. In this guide, you'll get a solid introduction to basic DSLR skills that you can use right away. Let's get started! Choosing between RAW or JPEG really depends on what you want to do with your photos. In this post, I will talk about what the basic differences are. If you are just getting started with your DSLR, this is an important question. While some compact cameras do shoot in both file formats, RAW is generally the domain of DSLR cameras. But if you have a compact that shoots in both, learning about the differences will help you get more out of your camera. Shooting an image in a RAW file format means it is stored on your memory card without being processed. The image quality, with all its color and clarity, remains intact to be processed later. It's definitely a better quality image than a JPEG! The detail captured in a RAW file makes it more versatile to work with in photo editing software, you'll have more editing options than with a JPEG. It's like having the raw ingredients to make a meal, as opposed to having the prepared meal. You can prepare those raw ingredients in many creative ways, combining them, adding spice and enhancing the flavor. Your options are wide open, allowing you to make a number of different meals with those same ingredients. When working with RAW image files, you'll need a program like Photoshop or Lightroom to open and edit them. Unlike food, when working on a RAW file you can save a copy and always have your high-quality original image. We go back to original RAW files many times to process them for various projects. RAW files take up more space on your memory card because of the detail they capture, they are more pixel-rich than JPEGs. With a JPEG file format, the data is processed at the moment it's captured. When you click the shutter release button, the file for that image is compressed and sent to your memory card. That means you lose some of the detail in your image. JPEG images are kind of like a prepared meal. It's yummy and ready to eat, but you don't have many options left. A JPEG file is smaller than a RAW file, that's why you can store more of them on your memory card. Unlike a RAW file, a JPEG loses data each time you work (open/close/share) with it on your computer. So with each action, the picture quality degrades. A RAW file can be processed and saved as a JPEG, but it doesn't work the other way round. JPEGs are easier to share because they are smaller files. You can process RAW files to be shared socially, but it takes longer. “Should I shoot in RAW or JPEG?” is a question I ask myself each time I plan a shoot. Which one I choose depends on what I want to do with the photos from that shoot. If I just want to share them socially, then a JPEG is a good choice. But if I want to use them for this blog or other projects then I always shoot in RAW. Shooting in RAW, processing, and then saving a JPEG file is a good choice for bloggers. All the detail from the RAW file is better for creating gorgeous photos, and using the JPEG in your posts makes your site load up faster. The best part is that your original high-quality RAW is there to go back to. Capturing a file of both would give you the most flexibility. This might be the best option if you want to share socially (on the spot,) and work with your photo in photo editing software. The downside is that it will take up more space on your memory card. You will also need to organize both file types when you offload your photos. How would you answer the question: Should I shoot in RAW or JEPG? What are your determining factors? Please share by commenting on this post. “What are pixels?” is an excellent question because they are the building blocks of every digital image. They are extremely important to picture quality! You are probably wondering about what pixels are, because you are looking into buying a new camera, or you want to learn about DSLR image quality. DSLR cameras (and film cameras) are basically just tools to capture light, no light, no photo. The better your camera is at capturing light the better quality photos you can create. The more pixels an image is made up of the richer, clearer, and sharper that image will look. Pixels are tiny, square or hexagon shaped (depending on your camera) information gathers. They gather the information from the light that enters your camera when you snap a picture, then they assemble it and send it to your memory card. …but with a pile of Lego you can build whatever your heart desires. The more Lego blocks, the more creative you can be. An individual pixel does not capture a recognizable image, but an army of pixels allows you to capture a masterpiece. The more pixels, the better quality images you can capture. All those little pixels are responsible for capturing the color, contrast, and sharpness of your image. If you are asking your self the question “what are pixels?” you may be wondering what megapixels are. The higher pixel-power your camera has, the better quality images you will capture. Look for the highest megapixel camera you can afford. Keep in mind that if you want to take the best care you can of the pixels you capture, you should shoot in RAW. What is the pixel-power of your camera? Are you thinking about getting a new one? If so why, and which camera are you thinking of? Please share by commenting on this post. In this post, you'll learn how to choose an ISO setting. the type of shot you're after. Low light requires a higher ISO setting. You might also want to adjust the ISO for action shots and shots taken without a tripod. Playing with the ISO settings can help you learn a lot about how your camera works. While ISO is fun to experiment with, I usually let my camera choose it automatically. You'll see why later on in the post. ISO stands for International Organization for Standardization, or International Standards Organization. The ISO setting on your digital camera allows you to control its sensitivity to light, it measures the sensitivity of the image sensor in your camera. The lower the light, the more sensitive your camera needs to be to capture the shot you're after. The lower the ISO number, the less sensitive it is to light. Each step up in ISO number doubles your camera's sensitivity to light. It also allows you to capture a photo faster. An ISO of 800 is eight times more sensitive than an ISO of 100. This would mean that if your camera was set at an ISO of 800, it would be 8 times faster at capturing an image than if it were set at ISO 100. Deciding how to choose an ISO setting all comes down to light and motion. The more light you have available the lower ISO setting you should use to get a crisp, high-quality photo. The exception to this rule is if you want to freeze action. As mentioned above, the higher your ISO the faster your camera will take the shot. So to freeze action you are going to need to go with a higher ISO, or your action will come out blurry. In the first picture (below) I was using a lower ISO so the water is a little more blurry. In the 2nd and 3rd picture I kept the ISO at 800 which allowed me to “freeze” the water. As I took these pictures, I set the ISO and let the camera take care of the aperture and shutter speed. Notice how those settings changed in the first two pictures as I adjusted the ISO, and then again in the 3rd, as I zoomed in. By reviewing the settings chosen by your camera, you can learn a lot. For example, the shutter speed in the pictures with the ISO of 800 is faster, so that tells me that shutter speed also has something to do with freezing motion. As the ISO goes up the camera becomes more sensitive to light, so the shutter does not need to be open for as long as it does when the camera is less sensitive. If you are shooting without a tripod, a higher ISO will help reduce camera shake in your image. A handheld camera is in motion, even if it is ever so slight, so if you can capture your shot faster there is less chance of seeing blur from camera shake in your shots. Choosing a faster shutter speed will also help reduce camera shake. I prefer adjusting the shutter speed rather than the ISO. You can also reduce camera shake by going with a lower aperture setting, just remember that lower aperture settings change the depth of field, so closer objects look clear while the background will be blurry. You may also want to choose a higher ISO setting in low light to make the most of the light available. The higher the ISO setting, the more grain (noise) you will see in your photos. Some of that noise can be softened when you edit your photos, but it's usually best to have the least amount of grain possible. To eliminate noise and capture the highest quality photos, it's always best to use the lowest ISO setting you can. For that reason, I usually choose to freeze motion by controlling the shutter speed (speeding it up) and letting the camera deal with the ISO. I find that the camera is pretty good at choosing an appropriate ISO. Shooting inside in low light (without a flash) might be one of the times I would manually adjust the ISO. Knowing how to choose an ISO setting will come from playing with the settings in various conditions, and then examining your results. To adjust the ISO settings you push the little button (seen here on my Canon camera) that says ISO. When the ISO screen comes up, turn the little black dial in front of the ISO button. The ISO is at 400. You will see that number change as you choose a new ISO. When experimenting with ISO, it's easiest to just let the camera take care of aperture and shutter speed for you. Keep in mind that if you set the ISO it will not change until you reset it, or set it to auto. So if you want to shoot in Aperture priority or Shutter priority mode, you'll want to make sure ISO is on auto, unless you want it on a specific setting. How do you determine how to choose an ISO setting? Please share your tips by commenting on this post. For a beginner (like me) learning about ISO, aperture and shutter speed can be confusing. When you want to get started taking better photos it can be hard to know which setting to concentrate on, and which ones to save for later. In this post, I'll share what I've learned over the past few months and hopefully, it will make understanding ISO, aperture and shutter speed easier. With this information, you should be able to grab your gear and make a few simple setting choices to capture some creative shots. I'll talk about some basic settings for taking a crisp landscape, freezing action, isolating images and capturing motion. These are just very basic, quick tips about ISO, aperture and shutter speed settings for beginners. Learning this helped me to start capturing more creative images. By following these tips you will be able to feel more in control of your DSLR and get purposeful shots, instead of leaving everything in automatic and taking what your camera serves up. ISO can be tricky because playing with it can introduce grain/noise (that's what makes a picture looks fuzzy) in your photos. Once you start increasing the ISO setting (going up in number) the noisier your picture gets. Because of that I usually keep the camera set to ISO automatic. Most of the pictures I take are outside and I've found that the camera is pretty good at choosing an appropriate ISO for the setting. Here is a shot where I adjusted ISO to freeze water. It was fun to experiment with, but I'd rather freeze action by adjusting shutter speed, more about that below. Changing the aperture settings is fun! By choosing an aperture like f/22 you can get a great landscape where everything is crisp and in focus from front to back. Remember to use a tripod with high aperture settings. By choosing an aperture like f/5 or f/6 you can really isolate your subject leaving the background looking nice and blurry. When I want to play with aperture I put the camera in Aperture Priority mode (usually marked on cameras with Av) and let it take care of ISO and shutter speed. For this shot I chose f/6.3. I love isolating my subjects and can't wait to start using a macro lens! Adjusting shutter speed can bring a lot of creativity and style to your photos. With a fast shutter speed, you can freeze the motion of water, catching water suspended in midair. You can do the same and freeze action, like your child as they jump in the air. I'm really looking forward to playing around more with fast shutter speeds! You can also capture the flow of motion with shutter speed. You just need to choose a slower shutter speed. By forcing the shutter to stay open for longer water starts to look milky/streaky/feathery, and the light starts to stretch, flaunting a long beautiful tail :). While we were visiting the park a few weeks ago I was playing with shutter speed and a fountain. The first pic shows the water stopped in midair because I used a fast shutter speed, 1/250th of a second. The second shows it much more fluid because I choose a longer shutter speed, 1/13th of a second. When I'm experimenting with shutter speed I put the camera in Shutter Priority mode (usually marked on cameras with S or TV) and let the camera take care of choosing the aperture and ISO. Before I learned these simple tips I was leaving my DSLR on P, which means it's fully automatic. I was just taking what I could get. The camera works well in automatic mode and I was getting some nice shots, but now I feel more in control and creative. Those are just some very basic guidelines to go by, the best thing to do is play, play, play and then learn by examining your results. Has this post about ISO, aperture and shutter speed settings for beginners helped you? What tips would you add? Please share by commenting on this post. “What does shutter speed do?” was one of the first questions I asked myself when I started learning how to use a DSLR camera. I wanted to know if I should be adjusting it along with the ISO and aperture, or if I should just leave it alone. As it turns out the shutter speed is one of the things I like to play with the most. It allows me to get creative because of how it affects the light and action/motion in my shots. The shutter in your camera is like a door that opens and then slams shut when you press the shutter release button to take a picture. It can slam down faster or slower depending on the setting you choose. The shutter speed determines how long light will be allowed to hit the light sensor when capturing an image. If you choose a faster shutter speed, less light gets in. If you choose a slower one, more light gets in. Adjusting the shutter speed allows you to freeze, or blur motion. It also lets you capture light trails. In this shot, the shutter speed is at 1/250, which is fast. You can see how the water drops are frozen. In the next shot, the shutter speed is at 0.5 which is much slower. Here you can see how the motion of the water was captured. Did you notice the blurry person in the background? He's back to the right between the fountain and the bush. A blurry effect is much nicer on water than on people. This picture is a bit overexposed, that's what happened as I lowered the shutter speed too much for this setting. You've probably seen those nice night shots of car headlights as they snake their way around a turn. And those cool shots of someone painting their name in the air with the light from a flashlight. One of the things those photographers did to capture those shots was adjusting their shutter speed. They slowed it down so as to capture the light trails. The slower your shutter speed, the more blur you will add to the motion in your shot. If you take a picture of a waterfall with a slow shutter speed, it will come out looking soft and milky-white. The same goes for a car driving by, with a slow shutter speed the car will look like it has a long tail trailing behind it. The faster your shutter speed is the more frozen your subject will be. Whether it's flowing water or a jumping ballerina, they will be frozen in their tracts with a fast shutter speed. The following pictures show what happens as I play with the shutter speed. In the first shot, the water is frozen, it becomes ever more fluid as I decrease the shutter speed. Notice how the picture also becomes brighter as the shutter is open a bit longer each time. As you can see in the above pictures, as I lowered the shutter speed and more light was allowed in, the f-stop went up. Looking at the results from playing around with shutter speed like this can help you better understand how your camera works. When using a slow shutter speed more light is coming into your camera, so it will be very sensitive to motion (your motion) which means you will need to use a tripod. Without a tripod, your pictures will come out blurry due to “camera shake” which comes from you. Some nice effects can be created with a bit of camera shake, but that is something you would want to go after purposefully. For the pictures in this post, I used the Gorillapod. I love it because it's not very big and it's super versatile, I mounted it on a guardrail. To play around with shutter speed put your camera in “Shutter Priority” mode. It's is usually marked by an S or TV (as on my Canon below) on your camera dial. When your camera is in Shutter Priority mode you adjust the shutter speed, while the camera takes care of the ISO and aperture settings for you. That's what I do to capture creative shots using shutter speed. In the above pictures, my ISO was set to 200 because I forgot to set it back to auto after my last photo shoot. ISO can be tricky like that, it's easy to forget to set it back to auto after adjusting it. Camera in shutter priority mode. To adjust shutter speed move the little black dial (in front of the ISO button) to the right or left. Shutter speed is at 1/125. As you move the little black dial (in front of the ISO button) you'll see this number change. What tips/facts would you add in answering the question, “what does shutter speed do?” Please share by commenting on this post. Shooting in Shutter Priority mode is one of the easiest ways to take control, and start getting more creative with your photos. Once you start getting more creative, your love for photography will get even stronger! Shutter Priority is much like Aperture Priority, except you are controlling the shutter speed, not the aperture. If you want to freeze action, blur motion, or capture light trails, Shutter Priority is where it's at! Shutter Speed is the term used to explain how long the shutter in your camera stays open to expose your camera's sensor to light. It can stay open for a fraction of a second, seconds or even minutes. The shutter itself is like a little mechanical door/curtain that blocks light from reaching the sensor. When you set your shutter speed, you are telling that door how long you want it to stay open. Automatic Mode: As the name suggests, your camera automatically chooses the shutter speed. Manual Mode: You set it yourself, along with all other settings. Shutter Priority: You set it yourself and your camera sets ISO and aperture automatically. Shutter Priority is a setting on your DSLR camera that allows you to take control of the shutter speed, without having to worry about adjusting the ISO and aperture settings. When you change the shutter speed in Shutter Priority mode, the camera automatically chooses the other settings for best exposure. 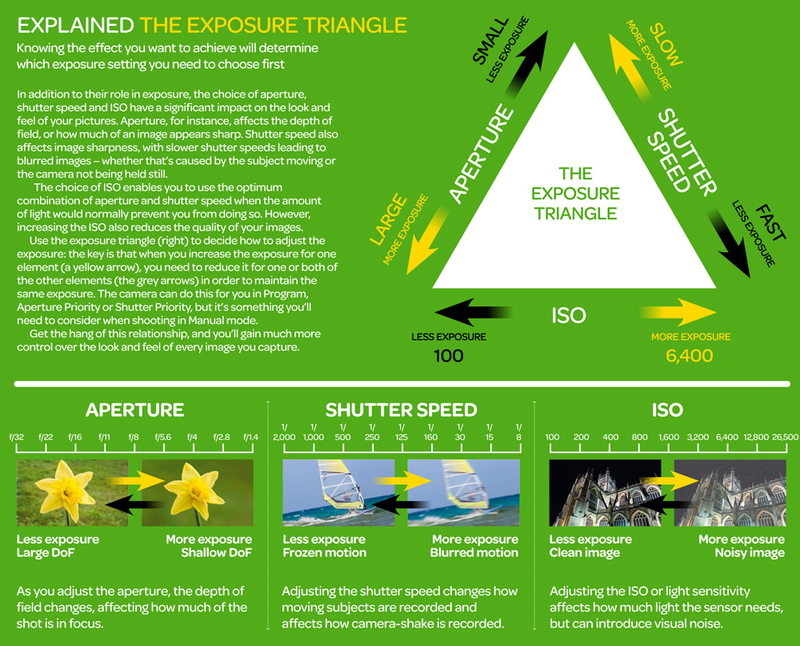 Shutter speed, ISO and aperture are the 3 components that make up the exposure triangle. When you change one aspect, the others need to be adjusted for proper exposure of your photos. If they are not adjusted properly your photo will be either too dark (underexposed) or too bright (overexposed.) So using Shutter Priority means the camera does the adjusting for you! Shooting in Shutter Priority mode is the easiest way to control your shutter speed because it allows you to concentrate on the action. Switching to Manual Mode (where you have to choose the ISO, shutter speed and aperture) takes time and a lot of know how. Many professional photographers choose to shoot in Shutter Priority because the camera usually chooses the proper exposure very well. In some settings, fiddling around in Manual Mode could cause you to miss the action altogether. Once you become familiar with Shutter Priority, you'll be able to choose your desired speed and capture your photo much faster. I almost always switch my camera to Shutter Priority mode when I want to get creative with the action/motion in my photos. On top of allowing me to experiment and play, it helps me capture better photos. That's why I love it so much, and why I think you will too! The best way to learn about Shutter Priority mode is to shoot in it – and play! For this shot I was using a shutter speed of six seconds. I had the camera in Shutter Priority and just kept firing away while sitting around the campfire. I love the crazy spark trails! A couple of my favorite experiences when I started shooting with a DSLR were using a slow shutter speed while sitting in front of a campfire (as seen above) and while shooting a fountain. I started out with a fast speed and just kept clicking that dial until it was nice and slow. It was so cool to see the results! Keep in mind that when you are using a slow shutter speed and you want your picture to look crisp, you'll need to use a tripod. Without a tripod, any motion coming from you will result in camera shake, and you'll have a blurry photo. In the photos for this post, I used the Joby Gorillapod. To set your camera to Shutter Priority, just turn the dial (as seen here on my Canon) to the “TV,”. If you have a Nikon, it will probably be marked by an “S.” And to change the shutter speed, turn the small dial in front of the ISO button. On a Nikon, this dial may be in a different location on the top of the camera, or on the back in the area to the upper right. As you turn the small dial you'll see the shutter speed change on your LCD display. Shutter speed is at 1/125. Shown in the upper left corner of the screen. To freeze action you will want to choose a fast shutter speed. To blur motion you'll want a slow shutter speed. Using a slow shutter speed is also referred to as a long exposure because your sensor is exposed to light for a longer period of time. Fast shutter speeds are great for freezing action at sporting events and to freezing water (or any other object) in the midst of its action. In the following two shots, I used a fast shutter speed. The fast speed allowed me to freeze the water falling over the rocks in the first picture. And to catch my husband's amazing smile as he went down the Slip'n Slide at our family barbecue. Slow shutter speeds (long exposures) are used to make water look milky, and to allow more light in for nighttime and low-light photography. Any motion or action taking place during a long exposure will be blurry in your photograph. This includes light motion, if the light in your shot is moving you will get light trails. You've probably seen cool shots of car light trails moving through a city, or someone drawing a heart with the light from a flashlight, those photographers used a slow shutter speed. And they probably shot in Shutter Priority. In the next two shots, I was playing around with light trails. The first one was shot through the car window, I was moving the camera in weird shapes while using a long exposure in shutter priority mode. The lights were from the car in front of us and oncoming traffic. The second shot is of a heart I drew while using a long exposure focused on the moon, my moon heart :). Using Shutter Priority mode is pretty easy. Just relax, have fun, and take lots of pictures. How do you use Shutter Priority mode? Please share your tips below! Do you want to isolate an image, perhaps a beautiful flower, while leaving the background looking blurry? Or capture a nice landscape and have everything looking crisp? Aperture is one of the 3 fundamental things you need to understand to get creative with your photography. The other two are shutter speed and ISO. For the pictures in this post, I set the aperture, and let the camera choose the shutter speed and ISO. It's the easiest way to learn what changing the aperture settings will do. I'll show you how to do that at the end of the post. In very basic terms, the aperture in a camera is the circular diaphragm in your lens that controls how much light enters your camera when you take a picture. The aperture settings are measured in “f-stops.” The higher the f-stop number the smaller the opening in that circular diaphragm, and the lower the f-stop number the larger the opening. It sounds confusing, but you will get used to it the more you play with your camera. Each f-stop lets in half the amount, or double the amount of light as the one before it. As you have probably guessed aperture is talked about in terms of stops… you go up a number of stops, or down, depending on what you want to capture in your photo. To keep everything sharp and in focus use a larger f-stop. To really isolate something use a smaller f-stop. I love playing with smaller f-stops and isolating objects, it's so fun! It's also helpful to know that a lower f-stop means a faster shutter speed, and a higher one means a slower shutter speed. For that reason, it's best to use a tripod when you are working with a higher f-stop. For the above pictures (isolated pictures) I used the Gorillapod, it's small and really versatile. For the landscape (field of wildflowers) I used a larger tripod for better stability and a different perspective. I was hand holding my camera in the two pictures below. In the first my daughter's face is blurry, but in the second it isn't. The difference was made because for the second shot I lowered the f-stop and the camera took the picture faster. That reduced camera shake because the shutter was open for less time. Remember, any motion (from your body) during a shot will shake the camera (camera shake) and create blur. Lowering the f-stop also added a little bit of isolation. In the second picture, you can see how the bushes in the background are not as sharp as in the first picture, this draws more attention to her face. To experiment with the aperture set your camera to “Aperture Priority” mode. It's usually marked on your dial with an Av. When your camera is in Aperture Priority mode you can play with the aperture settings, while the camera takes care of the ISO and shutter speed for you. As you look through your pictures on your PC you will be able to see how things like the lighting conditions and zoom you were using affected your results. You can learn a lot by comparing the shutter speed and ISO settings your camera chose while you clicked away in Aperture Priority mode. For example, in the pictures of my daughter, we see that the shutter speed was faster when I lowered the f-stop. This can help us understand why camera shake is reduced by lower apertures and faster shutter speeds, they both make the camera take the shot faster. Gear I used for this shoot; Canon entry-level DSLR, and the tripods I mentioned earlier. How would you answer the question, what is aperture in a camera? Would you like to share some tips? Please let everyone know by commenting on this post. If you're asking, “what is Aperture Priority?” it's probably because you want to take better photos. You want to learn how to express your vision, and add an artistic touch to your pictures. Using Aperture Priority mode on your camera is easy, and helps you take control of your photography. It's much like Shutter Priority, except you are controlling the aperture, not the shutter speed. If you want to isolate images, create a large depth of field and get some bokeh going on, then you should be shooting in Aperture Priority. Aperture is the term used to refer to the diaphragm like blades in your camera that open and close (like the pupil of your eye) in order to control the amount of light entering your camera. It can be wide open, letting in lots of light, or small, letting in less light. The wider it is, the faster light floods the sensor in your camera. The opposite is true as well, the smaller the aperture opening, the longer it takes light to hit your sensor to create a properly exposed photo. The aperture is measured in stops and referred to as f-stops. So when you see something like this f/10, it's a reference to the aperture setting. In Aperture Priority you set it, while the camera chooses the ISO and shutter speed. With your camera in fully automatic mode, your camera chooses it along with all other settings. In manual mode you choose it, and all other settings. Aperture Priority is the term used to describe the setting on your camera that allows you to choose what aperture you want to shoot in, while the camera assigns the ISO and shutter speed settings automatically. Shooting in Aperture Priority is a lot like shooting in automatic mode, it's easy, the only difference is that you manually choose the aperture setting. You don't really need to know very much about aperture to start getting some great shots. Aperture, ISO and shutter speed are the 3 components in the exposure triangle. They are kind of like the Three Musketeers, they always work together! In order to have properly exposed photos (not too dark, not too light) these three settings have to be adjusted properly. When one changes, the other two must change as well, or your photo will not be exposed right. When you shoot in Aperture Priority the camera chooses the ISO and shutter speed automatically, so you don't have to worry about them. That means you can take some creative control, without having to worry about balancing the settings manually. Lots of professional photographers shoot in Aperture Priority because it gets excellent results, and it's easier than full manual mode! To shoot in Aperture Priority turn the large dial on top of your camera to “AV” (as seen here on my Canon,) if you have a Nikon it's probably marked with an “A”. And to change the aperture/f-stop, turn the little black dial in front of the ISO button. On a Nikon, the dial may be on the back of your camera in the upper right area, or in a different location on top of the camera. You'll see the aperture setting change on your LCD screen as you turn that small black dial to the right or left. The aperture setting is at the top of the screen in the center. It is set at f/11, as you turn that small dial you'll see the f-stop number change. The best way to answer the question “what is aperture priority?” for yourself, is to play around with your aperture settings. Try choosing a subject and setting your camera up on a tripod and, then shoot a photo at various aperture settings. After that, leave everything the same, but this time try zooming all the way in on your subject and doing the same experiment. You'll probably learn a lot, and get some great shots! I used 2 different aperture settings in the next 2 photos. Notice how the wider aperture (f/5.6) in the first shot helps draw more attention to the sandcastle. In the second shot I used a higher aperture of f/10, that gave more depth of field. The larger depth of field distracts the eye from the texture I was trying to capture in this cool castle. To isolate an aspect of your image you'll need to choose a wide aperture. That means selecting a low number. My lens only goes down to f/5, many go much lower. The lower/wider aperture you choose the smaller your depth of field will be and the more isolation you'll get. Notice in this next shot how only the flowers in the center are in sharp focus. I was using f/5, so my aperture was as wide as I could get it, that gave me a shallow/small depth of field which made it possible get the soft feel I was after. To see a larger version of this shot (and all others) click on the image, and then click on the image that comes up. Using wide open apertures can really help you add artistic expressions to your photography. And you can use it to really draw attention to your subject. Be extra careful with your focus, where your focus point is, is where your isolation will be. In this next shot, I was focused right on my daughter's eye, if my focus was off this picture would not work at all. I love how the small depth of field helped me work with the playful expression on her face! With the background out of focus and the rest of the elements soft, her inquisitive eye is the highlight of this shot. Using a wide aperture will also help you achieve that bokeh look. The background of your photo will look blurry, with soft shapes of color and light. Using wide apertures can mean more freedom to move around. You don't necessarily need a tripod because when your aperture is wide open it's letting in lots of light, so your shutter speed will be fast. That means your camera will be taking the shot nice and fast, so you can handhold your camera because camera shake will not be much of an issue. But depending on what you are shooting, you may still need a tripod for stability. In the next shot, I was hand holding the camera in the passengers' seat while we were driving. The wide aperture of f/5 allowed me to get the shot I was after. To achieve a large depth of field (more stuff in focus) you will need to choose higher aperture numbers. The higher your aperture setting, the smaller the opening in your aperture will be. Higher apertures are often used in landscape photography because the large depth of field helps draw more attention to the beauties of a large expanse. To remember this concept it can help to think about what we do when we are trying to see something far away, we tend to squint, don't we? It's like we know subconsciously that squinting will help us focus. So, like your eye, your camera needs to squint or narrow down that aperture opening to achieve more depth of field. This may help as well: large number = large depth of field and little number = little depth of field. Knowing this may incline you to use the highest aperture number on your camera when you want a nice landscape shot. But most lenses perform best at a mid-range aperture, so keep that in mind if you want your photo to be nice and crisp. But photography is not just about getting crisp photos, it's about being creative and developing your personal style, so experiment and have fun! A great tip to remember is to use a tripod. When your aperture starts getting up in the mid-range area your camera will choose a slower shutter speed to compensate (as your aperture gets smaller) and let in more light. That means camera shake (movement from you) becomes a problem and will make your photos blurry. I hope you've enjoyed this post and that you have a better understanding of Aperture Priority. If you have some friends that would enjoy this post, please share it with them. Did this post help answer the question, what is Aperture Priority? What would you add? Please share your thoughts by commenting. Do you have aperture issues? Do you find aperture confusing, even frustrating at times? Some objects may be sharp and others blurry, like in the above photo. Maybe you wanted it that way – but maybe you didn't. Don't worry, that happens to everyone. We go out shooting and think we've gotten sharp landscape captures, and then open them on the computer and see something different. When that happens it's disappointing, but the upside is that every time, we learn something. In this post, I share a simple experiment that can be really helpful. If you're like me you probably take your camera everywhere because you don't want to miss an opportunity. But when you haven't been planning your shoot, you may not know exactly what aperture would work best. That's what happened to me one day while we were driving along the waterfront in Digby, Nova Scotia. So to make sure I left with the shot I wanted, I tried a little experiment. I set the camera up on my tripod and took a serious of shots, each with a different aperture. I favor shooting in Aperture Priority mode. So in the following shots, the camera adjusted the ISO and shutter speed for me. I set a 2-second self-timer on these shots to try and reduce camera shake. This was shot at f/22. You can see that everything is basically in focus, which is nice. But because of the high aperture, the iso went up, which introduced noise/grain and reduced sharpness. Here I used f/16. The flowers are starting to get blurry, and the iso was still higher than I wanted it. This was shot at f/10. The flowers are quite blurry here but could be used as an artistic element. The rest of this photo is sharper than the above photos, even on this gray day the ISO was at its best: 100. I chose f/7.1 for this shot. The flowers are too blurry here. This shot could still work if the flowers were cropped out. I don't find the soft (slightly blurry) rocks distracting, they could be used to pull the eye toward the boats. As you can see f/10 is a good go-to aperture for landscapes, especially if you have an entry-level DSLR, like me. But play around with them all, especially the mid-range ones. That will help you learn, and develop your personal style. Don't forget to use a tripod if you are after a sharp image. And remember that the higher your aperture setting, the longer your shutter will be open. So camera shake (which comes from you) and movement in the scene you're shooting will create blur in your shot. Lower aperture settings are best for handheld shots. In the past, I would have chosen f/22 for this shot, because it's my favorite for capturing a story. But from this experiment, I learned that when I want a sharp landscape, an aperture in the mid-range, like f/10 captures it better. Although I lost the focus on the flowers in the foreground, the rest of the photo is sharper and has better lighting. After this shoot, I was reading about high apertures and learned that the quality of my lens may mean that I can't use f/22 if I want really sharp landscape photos. The sweet spot for my lens (for a landscape like this) is in the mid-range. A good practice is to fire off a few shots each at around f/7 through f/10 and see which come out the sharpest. Once the tripod is set up and your photo is composed it doesn't take much time to capture the extra pictures but could mean you come home with the quality shot you were looking for. Remember to check your display and make sure your ISO is low (400 or lower is probably best) unless you are after an artistic look where you want grain/noise. What helps you reduce your aperture issues? Please share by commenting on this post. Before learning about landscape photography, I knew that seeing a beautiful landscape could lift my mood. And that I would love to capture similar pictures. One of the tips that helped get me off to a good start was that f/22 is a great storytelling landscape aperture. I now know that to create a great landscape photo, I need to choose the right aperture. In the past when I was using a point and shoot, I got some pretty good landscapes, but I think that was mostly due to the composition and how “smart” my camera was. It feels much different to purposefully create a nice landscape shot, to plan it out in advance, use a tripod and choose an aperture. There is definitely a feeling of satisfaction, more so than just amazement at the fluke shots I used to get with the point and shoot. f/22 helps keep everything in focus so the eye is pulled through the entire photo as your story is told. So, what is the right landscape aperture? That depends on what kind of a landscape you want to capture. I especially love landscape photos that tell a story, that pull me in with a large depth of field. That's why f/22 is such a great aperture for storytelling. I really like f/22 for landscape shots because it keeps everything in focus, and helps to create depth. Having some of my subject (the landscape and what it includes) close in the foreground helps to add interest and draw the eye from front to back. If the foreground were blurry, the eye would be focused on the sharper aspects farther back in the photo. The same goes for the background. With f/22, the focus is balanced, letting the eye take everything in. After learning this, I just needed to think about what stories I wanted my landscapes to tell. There is a little more to it than that, but you get the idea. I see a moment of childhood innocence and carefree days. The motion adds life and fun to the story. I wasn't planning this shot, but as my daughter bounded out of the field I just kept shooting. I'm so happy I did! A few days later, Bryan and Drew drove by the field again. Drew picked me some flowers because she had heard me talking about it. That was it, I had to go back and get a picture of her in that field! I really enjoy painting, I think I'll be using this shot as inspiration in the future. I'm looking forward to experimenting more with f/22 and creating different kinds of landscape shots with other aperture settings. Something to keep in mind about higher apertures is that an entry-level lens is usually at its best with medium or mid-range apertures (f/7 – f/10) so if you are planning on selling your photos, f/22 may not be your best choice, unless you own a professional lens. What's your favorite landscape photography aperture? Please tell us why by commenting on this post. Want to improve your photos in one easy step? For better photos, you should crop close for impact. And make your subject fill the frame. In this post, I'll share four examples of photos improved by close cropping. I'll also share examples of bad cropping and help you avoid this. Cropping to make your subject fill the frame is pretty easy and works really well, especially if you shoot in raw. This tip works best with subjects like flowers, people and pets – or anything that doesn't need supporting elements. You can apply this tip while shooting and when editing your photos. It isn't always easy to shoot as close as you would like: there may be obstacles you can't get around. Sometimes your only option to help your subject stand out is by cropping in on it while editing. Cropping in close is really fun and often surprising. It forces you to look at your pictures in different ways and from different angles. You'll notice interesting aspects of your subjects you didn't realize while shooting. It also helps to get rid of distracting elements, which take away from your subject. Here are four examples of how filling the frame can make a difference. I share the original shots and then the final product. These are all pictures that I filled the frame with by cropping during editing. Filling the frame during shooting speaks for itself. We were heading to the beach for a bonfire one evening and on the way, we passed these beautiful flowers. They were growing next to the road so I jumped out for a capture. I love the light in this shot! I like the original of this flower, but I especially love the light and textures near the center. Sometimes it doesn't feel right to cut out part of the subject, but it can help to make the photo more interesting and unique. Cropping in on the flame helps draw attention to the shape it's taking. Our eye is also drawn to the object it's burning, the textures and colors it's creating. There are so many photo opportunities at the zoo! After cropping in, the distractions are out of the way and more attention is drawn to his eyes and ears, which I love. Look at those lashes, and how the light is shining through his fuzzy ears and down the left side of his face, sweet! And here it is after cropping in. I still have the green and the distortion and, because the berries are the major focal point, I want to eat them even more. What should you crop? It depends on you – remember: photography is an art form. You can play with as many different crop options as you like – and see what fits your creative vibe. I love the history panel in Photoshop, it allows me to back out of it as many times I want. Don't worry – there's nothing scary about it! I'll be sharing a tutorial about how to crop in Photoshop in the future. Not everyone will agree on whether or not your final product is better than your original photo – and that's okay. It's like that with many art forms. Not everyone likes the same painters or sculptors. And even if you love one, you may not love every piece they've created. So have fun and do what feels right to you. With that being said there are some things you'll want to avoid, like cropping out too much, or cropping too close on out of focus or noisy/grainy photos (like the llama above.) Just look at what happens when I do that. With this crop, I cut out the cool textures and colors at the base of the flame. Although the shape at the top of the flame is nice, the photo is not as visually interesting. I was hand-holding my camera when I got this shot of the llama, so it's not as sharp as I would like. The ISO is also a little high (400) which adds noise/grain to the image. With a crop like this the noise stands out more (in the background around the top of the head) so the picture is not as pleasing to the eye. It's also cut too close to the left side of his face which feels a little claustrophobic. As you play with various ways to crop your photos, you'll learn what feels right and what doesn't. Don't be afraid to try. Just crop away, back out and try something different. What tips about cropping and popping would you share? Please share by commenting on this post. One easy midday portrait photography tip is to shoot in open shade. In this post, I'll share a couple of examples, and some tips for shooting in the shade. I'm really happy with the results of shooting in open shade. But there are also some things I would do differently. I'll talk about what I learned at the end of the post. I didn't want to take the photos in full sun because of the harsh shadows it creates. I took these next shots to show what that would have looked like. I wanted this photo in black and white, so you will see that option as well. Caution: Midday light can create distracting contrasts with bright highlights and dark shadows. Set your white balance to cloudy. I had read that photos taken in shade look cold because the light in the shade has a blue cast. To help take the blue edge off, I set my cameras white balance to cloudy. That helps warm things up. Watch out for sunspots. Even in the shade of the tree, I needed to ask my daughter to move around until I found an area without harsh light spots. Keep an eye on the wind. I also had to pay attention to how the branches were moving around. When the wind was blowing, the branches moved and allowed the sun to shine through. That created harsh areas of light on her face. Check light reflection in your background. The background was a little tricky as well. The first position I chose didn't work because the neighbors white house was creating too much of a distraction. It was reflecting the harsh light, and taking away from the photo. I fixed that problem by using the trees as my background, that meant changing position and moving some of the blossoms around. With the white balance set to cloudy, there is some warmth in this photo. I usually keep my white balance on cloudy. Another idea is to bring the sun into your shot by adding a sun flare. This can add interest and a little drama to your photos. Keep the sun at your subjects back. Use something (like branches) to diffuse the light. Use a graduated neutral density filter. I use the Neewer Complete Neutral Density Filter Kit. Get down low. I had to lay on the ground and get Drew to sit down in order to put the sun flare in the right place for these shots. Try using reflectors to bounce the light back on your subjects face. I have the Neewer 5-in-one set. It's great because the reflectors are collapsible, double-sided, and fit in a small bag. Shooting in the shade is a great midday portrait photography tip! I read about this tip in the book Life In Natural Light. Not being afraid to shoot at midday opens up so many more opportunities to capture great pictures. I need to pay more attention to distracting elements. For example, in the colored photo of Drew lying on the grass. The grass was short because lawn had just been mowed. But there were a few long blades sticking up into my shot (I edited them out of the black and white). Next time I'll be more observant and remove the distractions. Using a tripod would have made that first photo easier. I was too lazy to set one up, I set the camera on the ground. I even have an ultrapod and a gorillapod (which I used in the last two photos) that can get really close to the ground. I will be less tripod-lazy in the future! I love adding sun flares to my photos! Do you have a midday portrait photography tip to share? Please add to this post by commenting. Bryan and I have always liked taking pictures, but we weren't always in love with photography. Things started to pick up for us after we got married and started our family. I think we first fell in love with taking pictures when our daughter was born. But it seems different to love taking pictures than to love photography. Our parents (both sides) teased us that our daughter was probably the most photographed child in history. We just couldn't stop taking pictures of her, and they weren't digital! We went through rolls and rolls of film – and it was worth every penny. After a few years, we got our first DSLR and it was so much fun! Drew (our daughter) was known as “a child of a million faces.” Each time we clicked the button on that camera, she made a different face, and pose to go with it. It was golden. A classic sweet smile fake! She made taking pictures so much fun, and we loved going through them together. We still do. When we moved to Ecuador in 2009, our interest in photography exploded. Again, we couldn't stop taking pictures. Ecuador is such a beautiful country! The landscape, the people, the food, it was all so new and we wanted to capture it all. We were so excited that we started blogging about Ecuador. Our blog became the most popular English blog about Ecuador in the world. Thanks to the popularity of the blog, we were invited to go to the Galapagos Islands and blog about them. That's when we got our first GoPro. Once we got a taste for the time lapse and underwater capabilities of the GoPro, it was in our blood. It's such a fun camera! When we moved back to Canada earlier this year, we realized that we weren't just impelled to take pictures based on an amazing event (the birth of our daughter) or a spectacular place (Ecuador) anymore. We had begun to love capturing special moments and places, whatever or wherever they might be. And we realized that they are all around us, every day! Initially, we primarily used a point and shoot, and when we did use a DSLR it was usually on the “P” setting (meaning the camera did most of the work for us). We got a lot of great shots. But we knew they could be better. So we started learning more, and the more we learned, the more we loved what we're doing! Please tell us how you fell in love with photography by commenting on this post. Really very informative blog, as I am also a photographer. I will surely follow these tips. A big thanks from Mohit Bansal Chandigarh.